Hualing Nieh Engle, Co-director UI International Writing Program from 1977-1987. She came to UI in 1964 as a visiting writer and graduate student. Born in China, Nieh Engle and her family emigrated to Taiwan in 1949, where she taught at two universities and published nine books. She has translated to English the works of William Faulkner, Henry James and Stephen Crane. For the Spring semester 1971-72 she was head of the Department of East Asian Language and Literature. Her two-volume anthology, The Literature of the Hundred Flowers, was published in 1979 by Columbia Press. Neih Engle retired as Director of the UI International Writing Program in 1987. Paul Engle, an Iowa native, he came to UI in 1937 as a teacher of writing and lecturer in poetry. In 1932, Engle and four others received the first creative MA's awarded at UI. His thesis, "One Slim Feather," appeared under the title, " Worn Earth" and became the University's first thesis of poems to be published. (Stephen Wilbers, The Iowa Writers' Workshop, UI Press, 1980. 39) Engle did postgraduate work at Columbia University and was a Rhodes Scholar to Merton College at Oxford in 1933. From 1942-1967 he served as Director of the Writers' Workshop, resigning that position to become Co-director of the International Writing Program until 1977 when he retired to become consultant to the director., Hualing Nieh Engle. 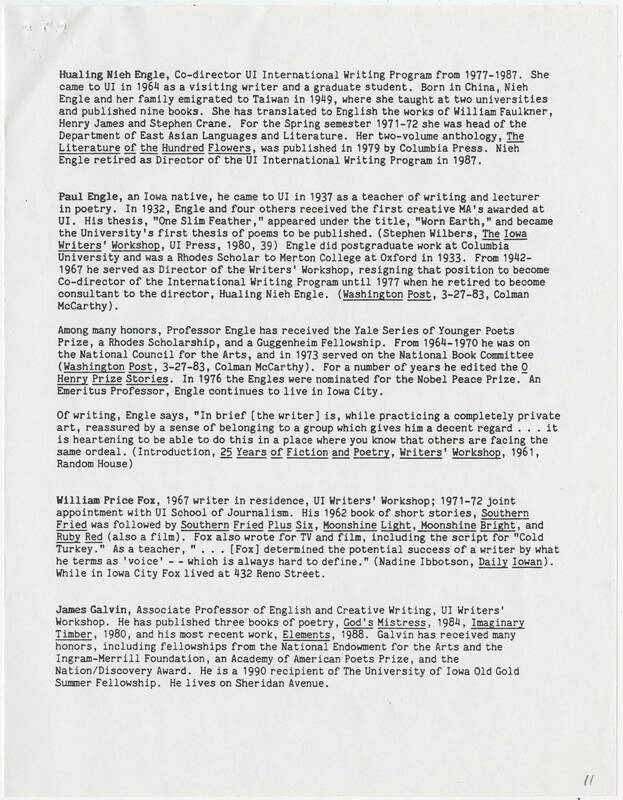 (Washington Post, 3-27-83, Colman McCarthy) Among many honors, Professor Engle has received the Yale Series of Younger Poets Prize, a Rhodes Scholarship, and a Guggenheim Fellowship. From 1864-1970 he was on the National Council for the Arts, and in 1973 served on the National Book Committee (Washington Post, 3-27-83, Colman McCarthy). For a number of years he edited the O Henry Prize Stories. In 1967 the Engles were nominated for the Nobel peace Prize. An Emeritus Professor, Engle continues to live in Iowa City. Of writing, Engle says "In brief [the writer] is, while practicing a completely private art, reassured by a sense of belonging to a group which gives him a decent regard. . . it is heartening to be able to do this in a place where you know that others are facing the same ordeal. (Introduction, 25 Years of Fiction and Poetry, Writers' Workshop, 1961, Random House) William Price Fox, 1967 writer in residence, UI Writers' Workshop: 1971-72 joint appointment with UI School of Journalism. His 1962 book of short stories, Southern Fried was followed by Southern Fried Plus Six, Moonshine Light, Moonshine Bright, and Ruby Red (also a film). Fox also wrote for TV and film, including the script for "Cold Turkey." As a teacher, " . . . [Fox[ determined the potential success of a writer by what he terms as 'voice' -- which is always hard to define." (Nadine Ibbotson, Daily Iowan). While in Iowa City Fox lived at 432 Reno Street. James Galvin, Associate Professor of English and Creative Writing, UI Writers' Workshop. He has published three books of poetry, God's Mistress, 1984, Imaginary Timber, 1980 and his most recent work, Elements, 1988. Galvin has received many honors, including fellowships from the National Endowment for the Arts and the Ingram-Merrill Foundation an Academy of America Poets Prize, and the Nation/Discovery Award. He is a 1990 recipient of The University of Iowa Old Gold Summer Fellowship. He lives on Sheridan Avenue.